Few television series in the twenty-first century have had as large of an impact with such a short run as Joss Whedon's Firefly. Debuting in 2002, the series ran for a mere 14 episodes and followed the crew of Serenity, a Firefly-class starship that traveled the galaxy in the year 2517. Headed by the charismatic Malcolm Reynolds, the ragtag group of adventurers took on odd jobs while outrunning both the sinister governmental body the Alliance and the monstrous, cannibalistic Reavers. Though the series was short-lived, it inspired a 2005 film called Serenity, as well as several comic book miniseries. Even with a relatively small amount of content to its name, Firefly has become one of the most beloved properties of the past twenty years, with fans still calling for some sort of television revival. BOOM! Studios are kicking off their "Road to San Diego" series of announcements with the reveal that they will publish a brand new comic series based on Firefly. Overseen by series creator Joss Whedon, the comic book will serve as a prequel to the television series, following Malcolm Reynolds through the oft-referenced Unification War. In addition to the new series, BOOM! will also release a collection of previously-published comics based on Firefly and Serenity. That's shiny no matter which way you look at it. Created by visionary writer and director Joss Whedon (Buffy The Vampire Slayer) and set 500 years in the future in the wake of a universal civil war, FIREFLY centers on the crew of Serenity, a small transport spaceship that doesn't have a planet to call home. Captain Malcolm "Mal" Reynolds, a defeated soldier who opposed the unification of the planets by the totalitarian governed Alliance, will undertake any job — legal or not — to stay afloat and keep his crew fed. Thrust together by necessity but staying together out of loyalty, these disparate men and women are seeking adventure and the good life, but face constant challenges on the new frontier, such as avoiding capture by the Alliance, and evading the dangers you find on the fringes of the universe. Beginning in November with the release of FIREFLY #1, from New York Times best-selling writer Greg Pak (World War Hulk, Mech Cadet Yu), artist Dan McDaid (Judge Dredd), and story consultant Joss Whedon himself, BOOM! Studios will take you back to the battleground where it all began...and reveal a secret history that might end it all. Fans have demanded it for years and now the definitive story of the Unification War—the intergalactic civil war that divided friend and family alike—is told at last! 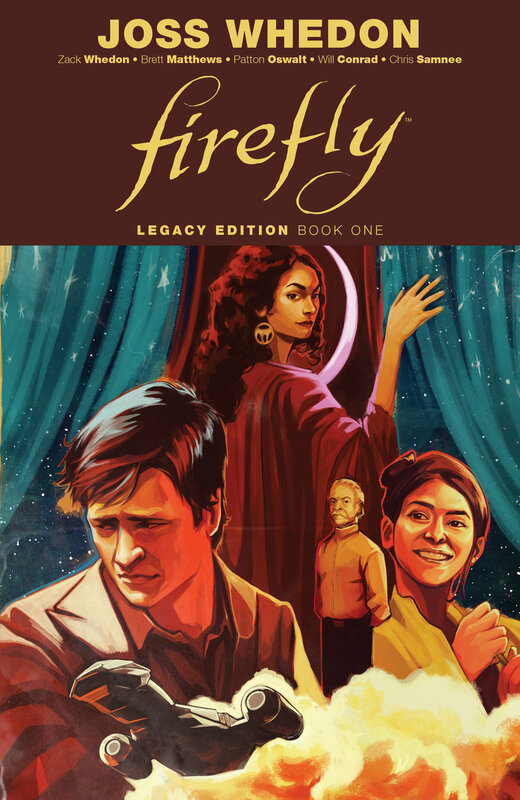 Firefly #1 and Firefly: Legacy Edition Book One will hit comic shops this November.